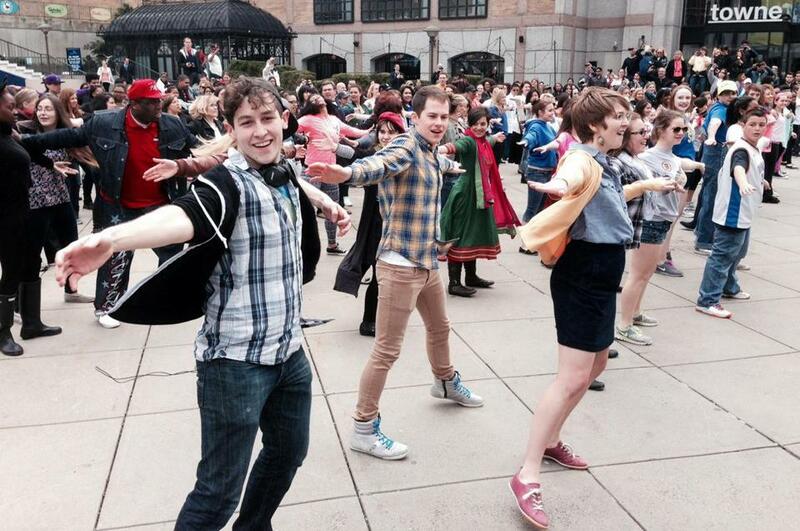 More than 250 people from dance studios in the Boston area participated in a flash mob at Boylston Plaza Sunday. The rain paused, the sky cleared, and they danced to spread a message of strength. More than 250 people from dance studios in Boston and beyond gathered at Boylston Plaza Sunday afternoon for a flash mob to introduce a new song commemorating the strength of a city torn by the bombings at the Marathon last year. Ariana Incorvati, 16-year-old cocaptain of Next Step Dance Company in Waltham, said none of the dancers had participated in a flash mob before. City Councilor Tito Jackson of Boston, who also showed off his moves, was impressed by what the organizers have done for the community. “I’ve watched them really embrace Boston, and they are exactly what we want to see of young people who come here to go to school. They’ve really made the city their own and they have just as much pride as someone like me who’s been here all their life,” he said. It’s a message Nicholson is spreading through music. Anne Steele can be reached at anne.steele@globe.com. Follow her on Twitter @AnneMarieSteele.